MERIAN, M. - America noviter delineata. America noviter delineata. - MERIAN, M.
Title : America noviter delineata.. 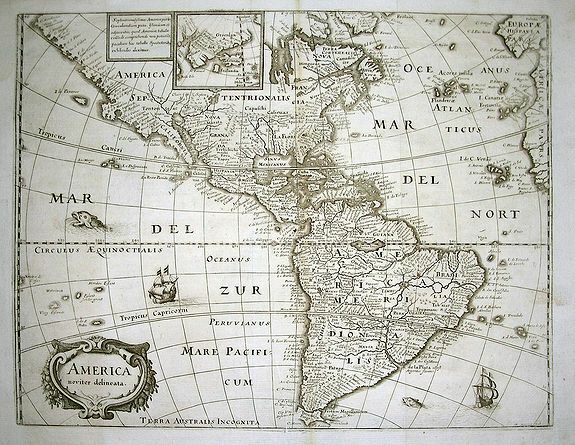 Description :Important map of the Western Hemisphere. Derived from Jodocus Hondius' map of 1618. Very detailed, filled with place names. With many curious geographical errors of the time: Strangely shaped California, unusual East Coast, no Great Lakes are shown, no Long Island. Numerous fictional islands in the Caribbean, over-sized Brazil, and a large fictional lake in southern Venezuela. With an inset map of Greenland. Decorated with a large title cartouche, two sailing ships and two big fish. Condition : Good and attractive condition: Mostly dark and clear impression. A few short printers creases and tiny cracks to centerfold. Additional vertical fold. Some occasional surface rubbing, spotting, uneven toning, and soiling.